The Aid for Child Trust (ACT) is a non-profit organisation founded in September 2015 in India that envisions “a world where every child lives in dignity”. Their mission is to solve the problems of poverty and human rights violation around the world by ensuring a lasting change to the lives of project beneficiaries. Currently, they have education projects in Noida and Bihar in India and emergency food assistance projects in South Sudan. They require volunteers throughout the year and here is an opportunity use your skills and enthusiasm for those who are in need. Volunteer with Aid for Child Trust in their education program for schools to help them get quality education. Aid for child trust is giving spoken English classes to under-privileged children. They require volunteers who are fluent in English language to take classes for children. If you are staying around Noida willing to help with the education of children with a fluency in English, volunteer with them. For more information about Aid for Child Trust, Click here! Follow their updates on facebook, click here! 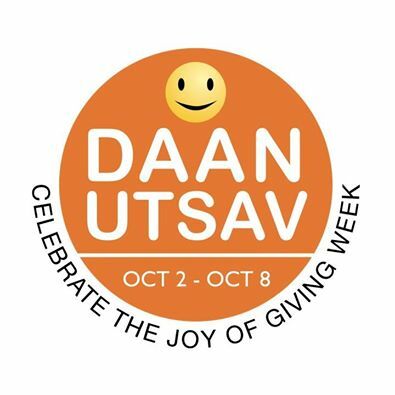 2018 will be the tenth year of Daan Utsav also known as Joy of Giving week, which is celebrated in India every year from October 2-8. A platform that brings together people from different walks of life and unites them in the act of giving. In 2017, over 60 lakh people across 200 cities participated in this event which included over 1000 companies, 1000 NGOS and the organisation of over 1100 events across the nation. Bhumi invites you all to the Vettuvankeni Beach Clean-up jointly organised by Bay Watch Farm Plot Owners Association and Bhumi. We all should have one common goal, ‘cleanliness’, which eventually leads us to a healthy environment. Ocean trash is a serious pollution problem that affects the health of people and marine lives. Trash on the shore can affect the local marine life like Turtles that usually hatch their eggs between December and March every year. Do sign up below and join us at the Vettuvankeni Beach Cleanup this Sunday with your family and friends. All are welcome. Our volunteering activities are strictly plastic-free; we use cloth gloves and props for clean-ups. Water for the volunteers is provided in steel glasses and utensils. Please carry cloth bags and avoid using plastics. The time of the year is back! Bhumi partners with CII for India@75 National Volunteering Week (NVW) which envisions what India should be in its 75th year of independence and seeks to bring everybody together in order to create an eco-system for structured volunteering in India. We are going to celebrate India@75 National Volunteering Week (NVW) for the fourth year in succession from 18 – 24 January, 2017. This time during the week, lets take the pledge #IforIndia by volunteering for Road Safety Awareness in Bhuvaneshwar! Sign up below and let’s volunteer to make India, an accident free nation ! We are going to celebrate India@75 National Volunteering Week (NVW) for the fourth year in succession from 18 – 24 January, 2017. This time during the week, lets take the pledge #IforIndia by volunteering for Road Safety Awareness in Thrissur! The program is rooted in the belief that as a nation it is important to develop a cadre of leaders exposed to the complexities of bringing change in social and public systems. The Gandhi Fellowship Program is designed to provide you with the opportunity for personal transformation through self-discovery and thereby, contribute to the causes surrounding you. Chairman of Piramal Group – Mr. Ajay Piramal underlined the contributions of Gandhi Fellows in rural areas. Actor Akshay Kumar participated in the event. This may come in many forms, such as dropping in unexpectedly to see if there are volunteer opportunities or calling to confirm the date and time of their next volunteer date. Let’s take a closer look at how to deal with volunteers who seem to require more of your time than others. So how do you handle this type of volunteer? It goes without saying that time and staff are at a premium at most nonprofits, so hand-holding those individuals is counter-productive. On the other end of the spectrum is “firing” a volunteer, but that is a worst-case scenario, which could lead to some negative publicity for your organization in the process. The good news is that there are options in between that just might save the day. Below we offer our best advice to volunteer coordinators for managing high-maintenance volunteers. Did we give this volunteer proper orientation and training? Although they are best practices, these crucial pieces sometimes get lost in the shuffle. For example, if Betty doesn’t completely understand the organization’s mission or her importance to it, she may not realize how critical it is to make the best use of staff time. Likewise, if Betty was thrown into a task with minimal training to begin with, she may be hesitant and unsure of herself, feeling the need to often interrupt and ask questions. Is this the best task assignment for the individual? People are drawn to volunteer at a nonprofit for various reasons. Perhaps Tom works with computers all day. Because of his expertise, the volunteer coordinator assigned him similar tasks without really giving him other options, when Tom really wanted a change of pace. Or maybe Mary was assigned to stuff envelopes and is totally bored with it. In either case, these volunteers may lack interest in the task at hand and this could make them more difficult to manage. Giving volunteers a choice of activities, on the other hand, should allow them to choose something they enjoy and keep them more engaged. Does the volunteer simply want more social interaction? Some individuals volunteer to get out of the house and have someone to visit with. If the task they are given involves sitting in a cubicle alone, chances are good that the volunteer will be looking for conversation. This doesn’t work well when the person targeted is the volunteer coordinator or another staff member. If this is the case, the solution may be as easy as simply pairing him or her with another volunteer to work on a project together. Is our organization communicating effectively with volunteers? As we mentioned earlier, perhaps you have volunteers “swinging by” to see if there is anything that needs done or touching base because they can’t remember the next time they are scheduled to come in. An answer here would be to implement a cloud-based volunteer management system, such as VolunteerHub. This type of tool allows volunteer coordinators to list opportunities so volunteers can choose activities they like best that fit into their schedule — and self-register from any internet-accessible computer, tablet, or phone. VolunteerHub also brings the power of automated confirmation and reminder emails and text messages. This eliminates calls or emails from those forgetful or disorganized well-meaning folks who may be checking in often with you on specifics. High-maintenance volunteers don’t have to stay that way. Evaluate what’s really going on in each case. Many times it’s just that a volunteer’s expectation hasn’t been met in some way and a small change could make all the difference. Spending a little more time in training, learning more about motivation to volunteer, and/or automating registration and communication can save countless hours and headaches in the long-term.